Good morning, forex junkies! Time to see which comdoll setup could’ve gained us some serious pips! For this week, let me show you how a simple support level could’ve given us a nice 5:1 reward-to-risk trade. 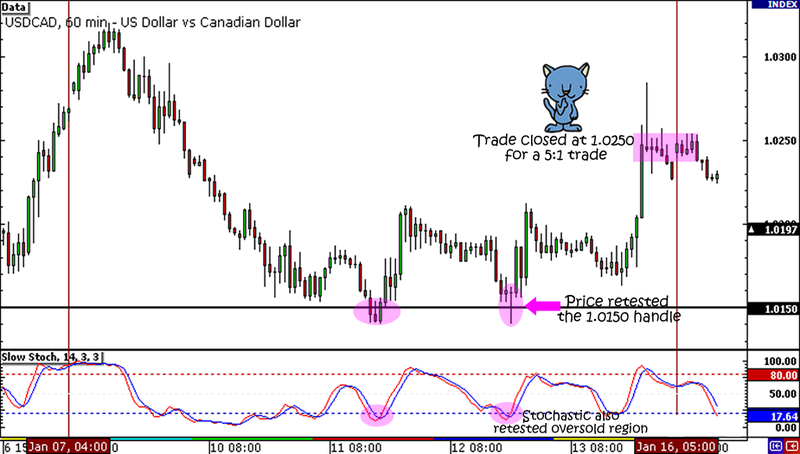 On USD/CAD‘s 1-hour chart we can see that the pair bounced from the 1.0150 level, a minor psychological handle (MiPs), during the middle of the week. Heck, I was even talking to @Barrine10 over Twitter a few sessions before it happened! The 1.0150 handle has been a significant level for USD/CAD you see, so I thought that it might be a better support level than 1.0200. Anyway, it was too bad that I had my eyes on my NZD/USD trade at the time, because I wasn’t around when the pair hit the 1.0150 level again on Thursday. And to think that Stochastic was in the oversold region at the time! If I had placed my stop below Wednesday’s low (around 20 pips) and closed my trade at 1.0250, another MiPs, by the end of the week, I could’ve gotten 100 pips, giving me a 5:1 risk trade! Sheesh. Oh well, at least I now know that I’ll still be able to get good setups even when the pairs don’t make gazillion-pip movements. How about you? Did you trade any setup with a higher risk ratio than 5:1? It doesn’t even have to be comdoll-related! Just let me know so we can all pat you in the back! Have a great trading week, guys! The comdoll gang started the week on a strong note as risk-taking stayed in vogue on Monday. AUD/USD surged to the 1.0350 area while NZD/USD climbed near the .8000 handle. Unfortunately, as I mentioned in my trade idea for the week, the Kiwi’s rally wasn’t strong enough to reach my short order right at the .8000 mark! The Aussie was propped up by strong economic data for the next couple of days, as Australia printed an 8.4% surge in building approvals and China reported a higher than expected trade surplus. Canada, on the other hand, revealed a larger than expected decline in building permits as the report showed a 3.6% drop for November. There were hardly any comdoll-related reports released for the latter half of the week, leaving the commodity currencies stuck in consolidation. Before the week came to a close though, global economic concerns such as the Iranian oil embargo and persistent euro zone debt concerns brought risk aversion back on track. It didn’t help that the U.S. printed weaker than expected trade balance, causing traders to revert to their worrywart selves. As always, it was one of those topsy-turvy weeks for the comdolls and I’m sure you can’t wait to find out which pair churned out the best setup for the week. Stay tuned!